The Mandala is the most popular of all art motifs in Buddhism. In Sanskrit, a mandala means a ‘circle’ or a ‘group’, thus implying that the Buddhist Mandala is sacred collection of auspicious symbols, arranged in a well-defined circular pattern. 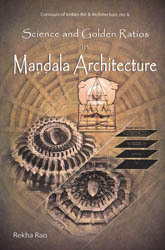 These Mandalas are a sort of writing, bringing one is direct communication with divine forces. All Mandalas, even though following a similar scheme, differ in respect to the placement of the various elements making up the mandala. The basic structure is always circular, inside of which is a concentric square enclosure with four gates, one for each cardinal direction. At the exact centre of this square is situated a deity, a symbol, or sometimes a mantra, which is the defining entity of the mandala, around which it is organized. It is the particular energy of this central power which grants mandalas their Shakti or potency. This is why a mandala is named after the entity presiding at its centre – for example Buddha mandala, Tara mandala, Vajra mandala, Om mandala etc. A Mandala is the most effective way of representing the otherwise invisible forces which govern the universe. They are mystically charged diagrams which are used to initiate adepts into the fold of Dharma, and also, after they have been initiated, as a support for their meditative practices. Meditation on mandalas requires the practitioner to embark on a journey beginning with the outermost concentric circle, entering the square through one of the four gates and then finally finding oneself in divine communion with the sacred forces residing at the centre of the mandala. There is no doubt that in the annals of spiritual art, mandalas represent one of the highest pinnacle humanity can aspire to. It is an art form which both encompasses and at the same time transcends the manifested world of material reality.